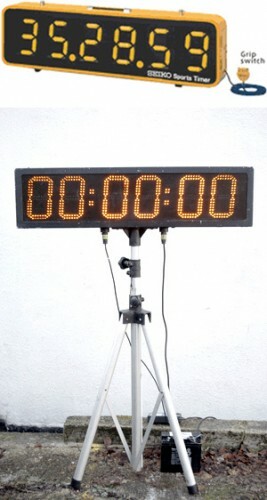 Sport Systems have large display single-sided Seiko clocks and double-sided ECM clocks. These can be used to time a range of events other than running or athletics. Display: LED, 6 digits (yellow) Character height … 180 mm. Power: The clock is powered by an 12volt external car battery that we supply . Battery life is about 20hrs.